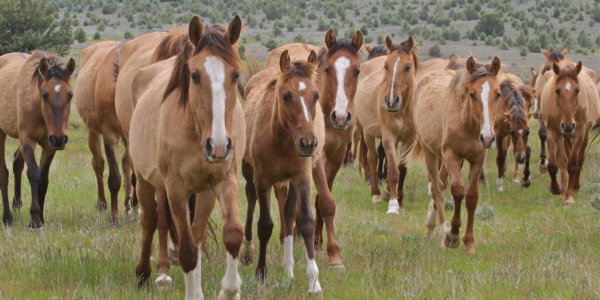 (Pronounced hee-luh) These horses carry a history believed to stretch from wooden ships and Jesuit missionary Padre Eusebio Kino’s 17th century arrival in Arizona through a wild herd that: lived in relative isolation in Arizona, was captured by the government after conflicts with ranchers, was taken to a sanctuary in South Dakota that later fell on troubled times. 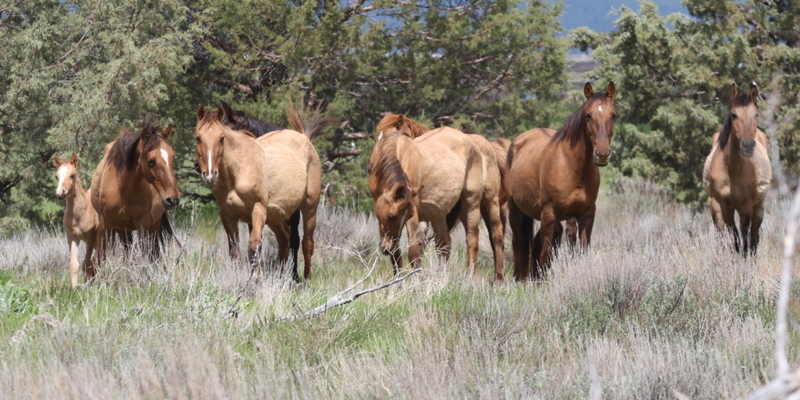 These are the horses of the Gila herd. In shades of earth and charcoal, striped legs and dorsal stripes, they look as though they’ve walked out of a cave painting, draped in the mystery of the ancient past. Join us for the next chapter in their story. 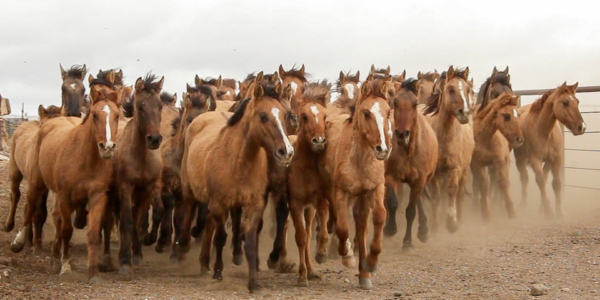 The Gila Herd Project is a two-year effort to comprehensively vet the horses. 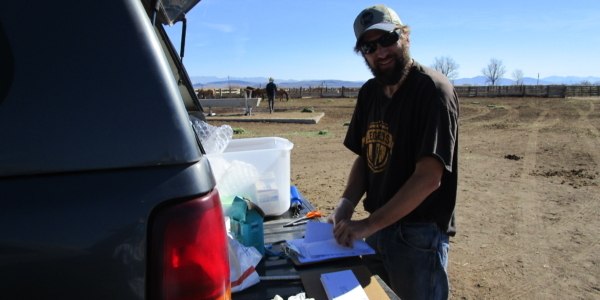 DNA testing will determine the health and diversity of the herd. Comparing that analysis with the phenotypic observations will help determine if a conservation program is warranted and then to help establish a sustainable conservation program. Through careful observation, we are identifying, documenting, and tracking specific bonded harem bands. RTF hopes that over the next two years, it will be able to hand over a Gila conservation program to other entities or foundations that will ensure their existence for future generations. RTF may also be adopting out bonded younger horses through private adoptions. At a recent conference sponsored by The Homes For Horses Coalition, RTF Founder Neda DeMayo was appreciated by Fleet Of Angels Founder, Elaine Nash. Nash expressed profound thanks to DeMayo and RTF as a driving force in getting this rescue, believed to be the largest in US history, off the ground and galvanizing support from organizations and a private foundation who, together with many generous donors like you, saved over 900 horses from auction and probable slaughter. 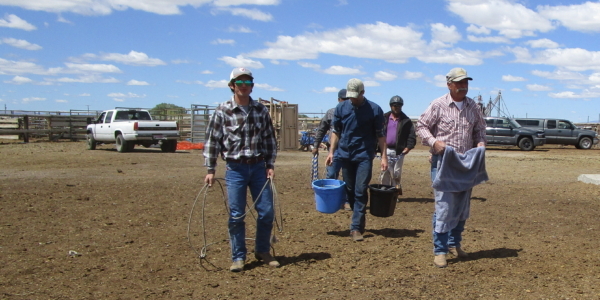 On June 15th, twenty-five geldings and seven stallions made the journey from the temporary staging facility in Fallon, NV to California pastures in Lassen County where they rejoined the mares and foals. It has been weeks since they have seen each other. 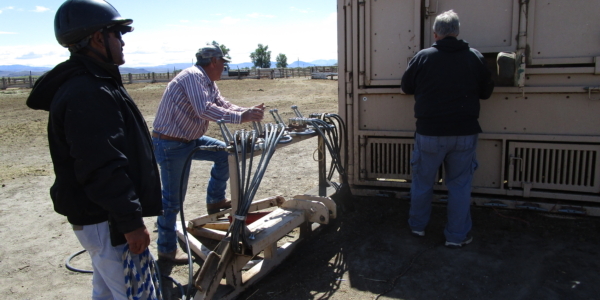 The first few off the trailer bolted up toward the trees while the bulk ended up running toward where the mares and the foals were. 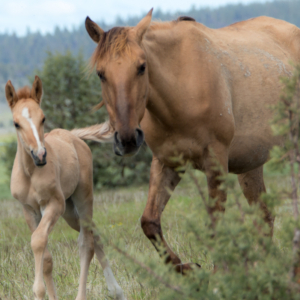 Perhaps surprised by their arrival, the mares and foals ran from them until the herd circled around the lake and then rested back at the grassy area near where the unloading took place. 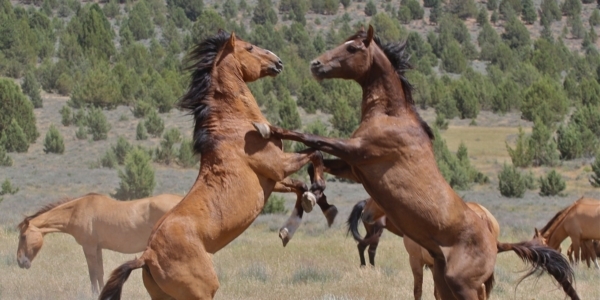 A physically charged scene ensued with the stallions squaring off frequently, challenging, and chasing each other. They immediately began to try and push the mares and foals into their own harem bands, lowering their head and snaking to keep them in place. RTF staff are onsite monitoring the horses’ safety while the stallions sort out their dominance. 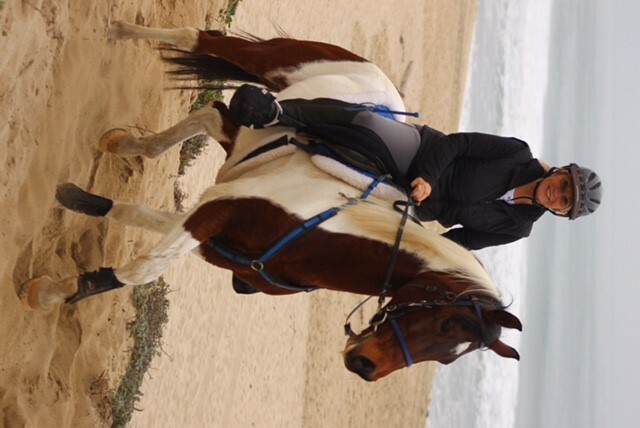 We asked RTF’s In-Residence Volunteer Paloma Ianes, recent University of Cincinnati journalism graduate, to describe her favorite experiences and horses during her stay. We thought you’d enjoy her thoughts as someone who spent time with the Gila Herd as they lived through their big move and transition as part of RTF’s rescue. 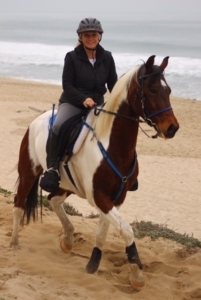 “One of the many things my experience at RTF allowed me to do is observe natural wild horse behavior. 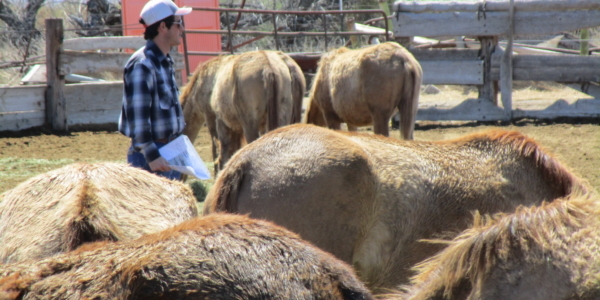 I think one of the most fascinating experiences I had in this regard was my time in Lassen County, where RTF has leased land for the rescued Gila herd. I got to witness the stallions, brought from a temporary facility in Nevada, be reintroduced to their mares and foals, who had already been living at the Bieber ranch for four months. Developing a plan for a sustainable future for the herd has required making decisions. 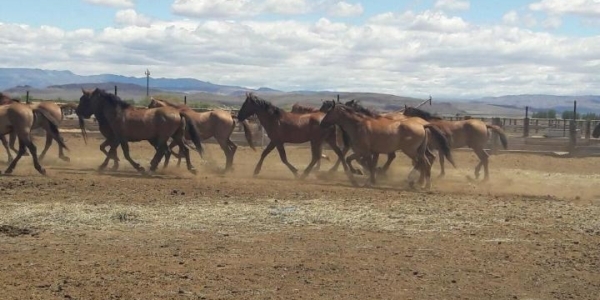 Multiple generations of closely related Gilas arrived in semi trailers with no records — no indications of who birthed whom or which stallions and mares were bonded together. RTF opted to geld all stallions under a certain age on April 17-18 while maintaining 10 stallions. 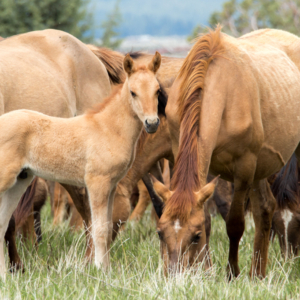 Along with colts that continue to be born, the stallions should more than enough genetic material to begin a conservation program. 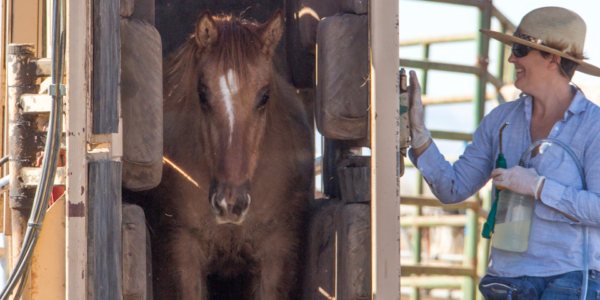 Six weanling colts and three stallions were sent to RTF’s American Wild Horse Sanctuary in Lompoc, CA to receive special attention to hooves and dietary needs. 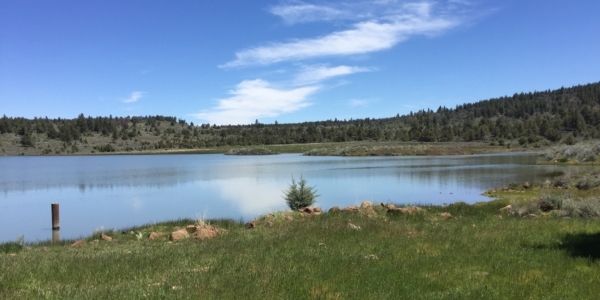 On May 1, 2017, a beautiful spring day, 59 mares, weanlings and yearlings travelled four hours to a private pasture in Lassen County, Calif., ringed with ponds, wild flowers and juniper trees. Hooves clattered on the metal ramp, each thin, shaggy mare as wide-eyed as her ancestors must have been while climbing down from a wooden Spanish ship centuries before. 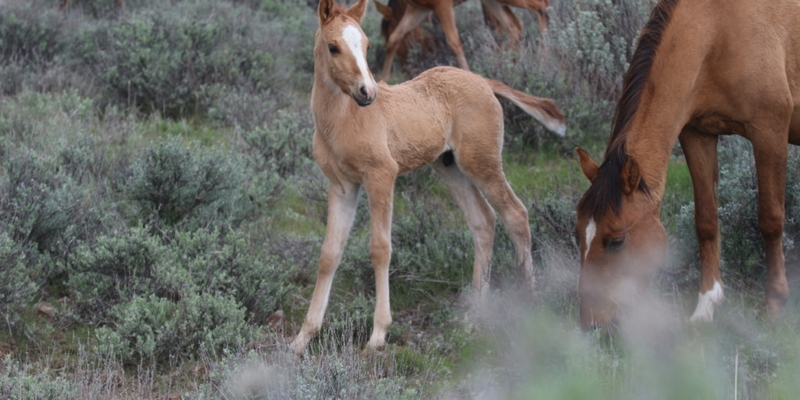 Nine foals scrambled from a stock trailer, greeting their mothers, extended herd and a new life with high-pitched whinnies. Just two months earlier these mares, some with weanlings and yearlings by their side and many heavy in foal, left the last of winter snows and mud behind for dusty temporary corrals in Fallon, NV. 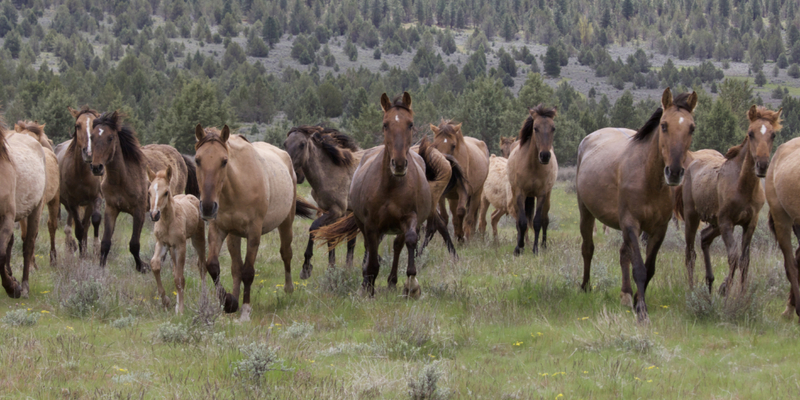 As they had in South Dakota and Nevada, the horses remained grouped tightly together at all times as they explored their new environment. Two days of photography began revealing which yearlings and weanlings remained at their mothers’ sides as well as two, three and four year olds who still remained closeby. 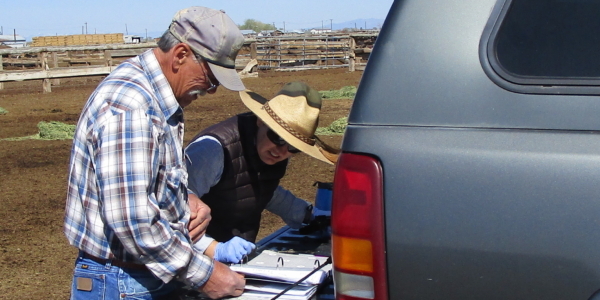 As RTF provided for the immediate needs of the Gilas at the staging area in Fallon, NV., it began an assessment that would begin to guide any future conservation plan. 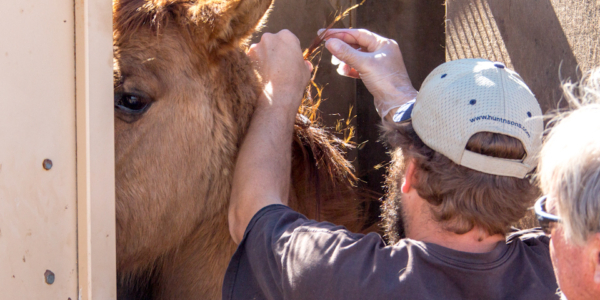 Hair samples were taken from each horse for DNA testing at Texas A&M University’s Animal Genetics Lab. 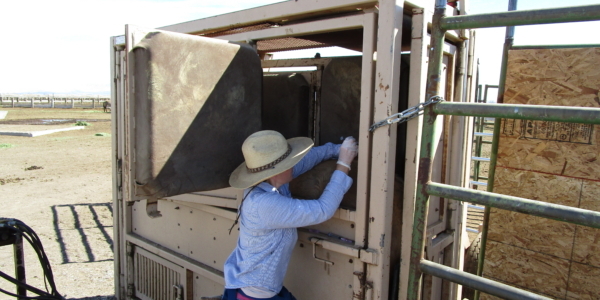 In April, RTF biologist Celeste Carlisle started all mares on fertility control. 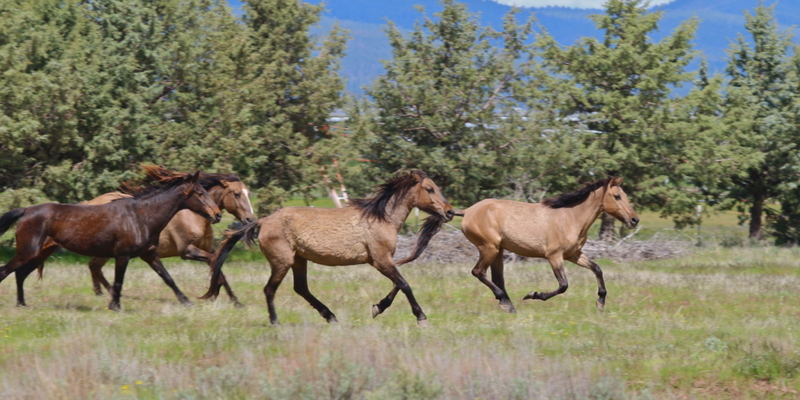 All mares were boosted a few weeks later and would soon be reunited with the males of the herd. 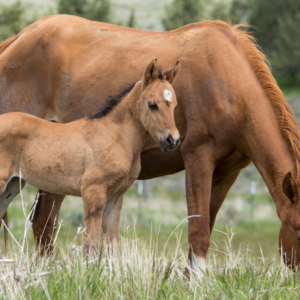 Since the vaccine does not work on all mares, we assume that 2-9% of the mares could continue to foal, based on data from RTF’s American Wild Horse Sanctuary and from the Science and Conservation Center in Billings, MT. RTF assembled a small but experienced team with daily management led by Mike Holmes, and immediately began providing quality hay for the herd. 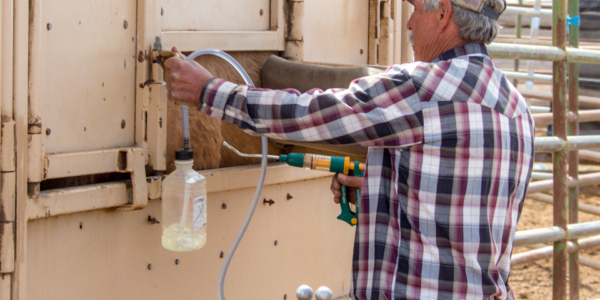 The Gilas were wormed, vaccinated, microchipped. Photographer Steve Paige and biologist Celeste Carlisle photographed and made drawings of each horse, helping us begin to document and track each and every horse. Health assessments found that several of the horses were partially blind (cause unknown), and that many mares were pregnant. 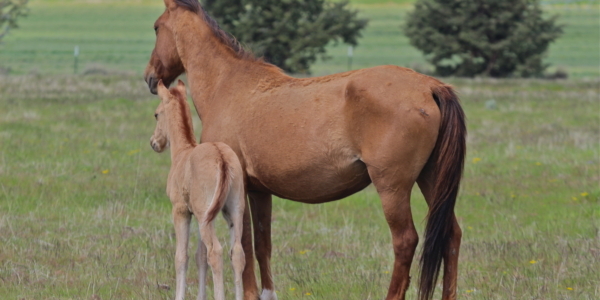 Three mares did not bond with foals later born at the staging area, likely as a result of stress of transport during the late stages of pregnancy. Palomino Armstrong provided timely care to 2 orphan foals. Unfortunately, one filly did not pull through. 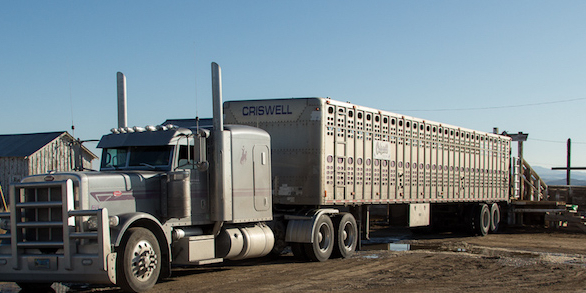 Having survived blizzards and freezing temperatures that covered their winter coats with ice for weeks, on February 26th, 112 Gilas were loaded into trailers and trucked more than 1,200 miles from South Dakota to temporary staging area in Fallon, NV. Some arrived wild-eyed, with the shadows of their ribs showing through their fur and hooves grown long and curled. Their parasite load was heavy. 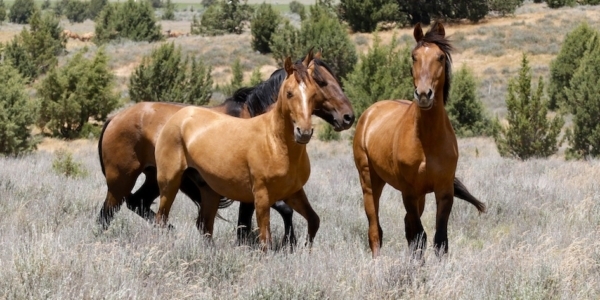 In October 2016, the State of South Dakota made a ruling of neglect against the International Society of Mustangs and Burros and two counties impounded 907 of the organization’s horses, including the Gila herd. Fleet of Angels and Palamino Armstrong were successful in adopting out 270 horses before the state’s cut off-off date but the remaining horses were scheduled for public auction on December 20th so the county could recoup its costs. Return to Freedom appealed to colleagues at the ASPCA and the HSUS to match a generous contribution from the Griffin-Soffel Equine Rescue Fund which made it possible to avert the public auction at which most all of the horses would have been purchased by kill buyers who were anticipating the sale. 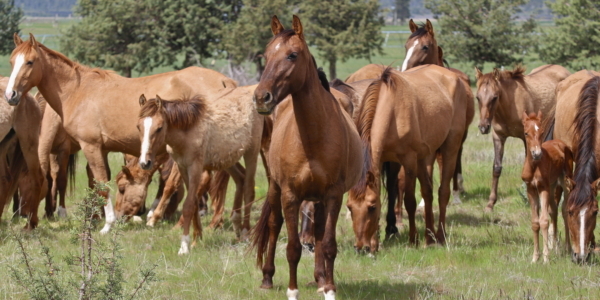 The state subsequently reached a settlement with ISPMB transferring ownership of most of the horses to Fleet of Angels to continue managing adoptions. 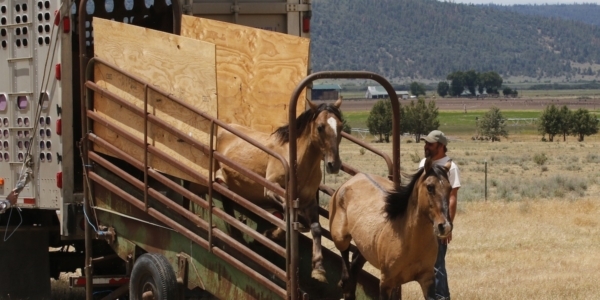 RTF took responsibility for 112 Gila horses (including over 20 pregnant mares). In spite of the suffering that the horses endured without shelter from winter conditions, as well as a lack of infrastructure and resources to provide for their needs and veterinary care, we hope that we can all remember that before the years leading to this unfortunate event, ISPMB dedicated decades to saving herds and supporting policy reforms to protect the freedom of wild horses and burros on the range. 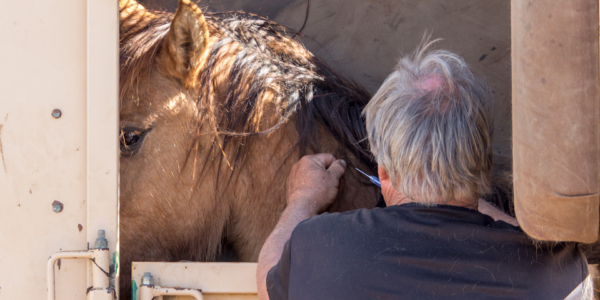 Unfortunately, without implementing any population control, financial challenges increased and the result was devastating for the organization, the horses and the equine-welfare community. We hope that balance can be restored to all of the horses and humans affected. The Gila herd horses are believed descended from horses brought to what is now Arizona in the 1600s by the Jesuit missionary Eusebio Kino. Later, a wild herd lived a mostly isolated existence for many years north of the Gila River. 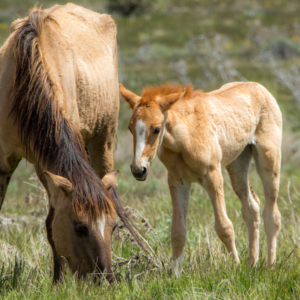 Though locals recall the small, dun-colored horses always being there, moving along the tree-lined river in small groups, they were not counted or included when Congress passed the Wild Horse and Burro Act in 1971. Instead, the area about 85 miles southwest of Phoenix was marked as the Painted Rock Herd Area for burros. 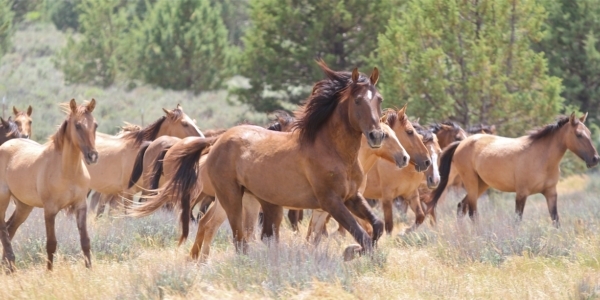 In 1993, farmers began complaining about wild horses. 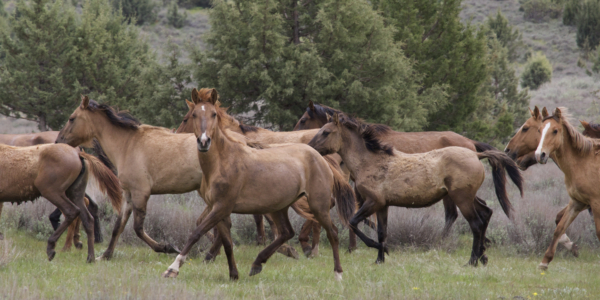 The BLM treated them as strays and removed them, though others recall horses routinely being killed or captured and removed by locals for decades. 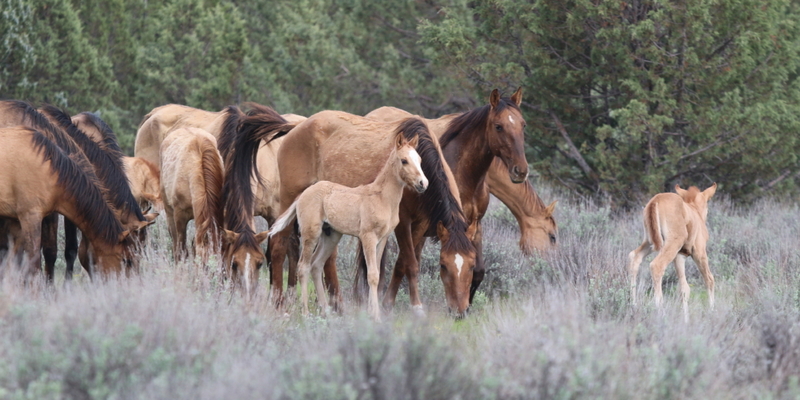 The International Society for the Protection of Mustangs and Burros advocated on behalf of the wild horses. 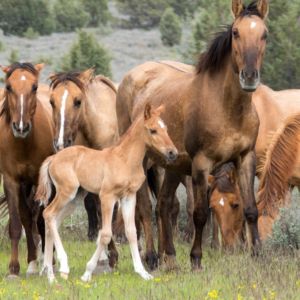 The BLM’s Phoenix field manager agreed that the wild horses were probably present there in 1971, when the Act was passed, and should be afforded the same protections. 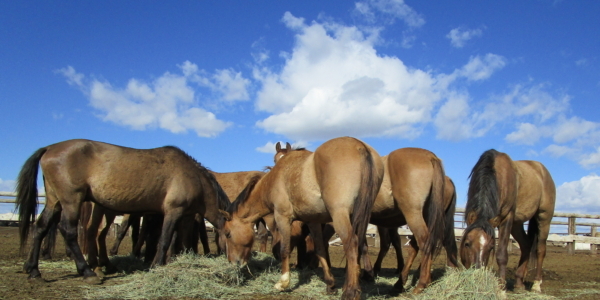 A Herd Management Area was never established, however, and nuisance complaints continued. 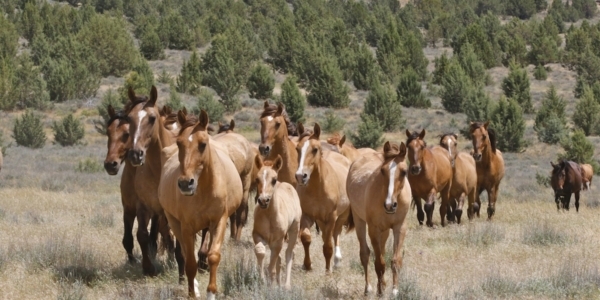 In 1999, the agency opted to capture the remaining wild horses there. Thirty-one were transported to ISPMB in South Dakota. 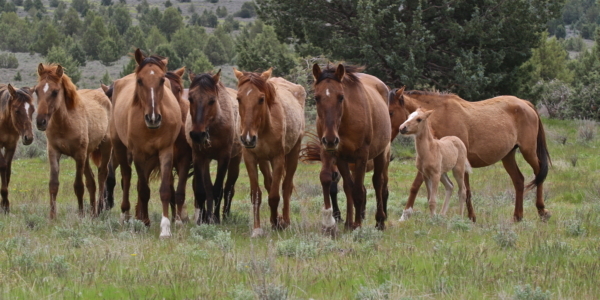 “From the combined evidence involving the low variability of the herd, the lack of recent genetic introduction into the herd and the observed genetic relationship between the Cerbat herd to the Painted Rock herd, and their geographical distance from each other, one would have to assume that these wild horses are descendants of the old Spanish horse,” E. Gus Cothran, then a University of Kentucky geneticist (now director of Texas A&M University’s Animal Genetics Lab), told Indian Country Today in 2000. “I was inspired to pursue the rescue mission because Neda was able to create an actionable plan,” Griffin-Soffel said, “As things unfolded that were out of our control, plans changed — but we kept moving forward.” Click to read more about Patricia’s inspiring story. Will you watch over the Gila Herd? Join our #watchoverme #jointhegilaherd campaign started to launch into the care fundraising campaign stage of our project. 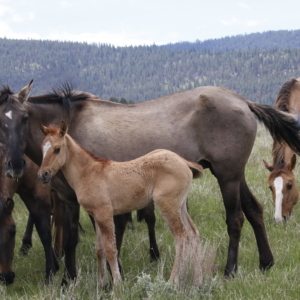 By watching over a Gila horse, foal, or family band, you join the Gila herd to ensure that the Gila herd thrives. The Griffin-Soffel Equine Rescue Fund has been the catalyst and is energizing our campaign. 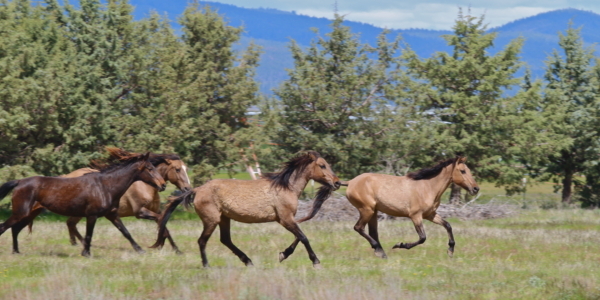 Patricia Griffin-Soffel has joined the Gila herd and we invite you to step forward and join us too. The Griffin-Soffel Equine Rescue Fund has pledged to match donations dollar for dollar up to $150,000. While the scope of the first phase of this project is estimated to take 2 years and $300,000 and may seem like an overwhelming task, we’ve got off to a healthy start* from individuals just like you thanks to the matching pledge. 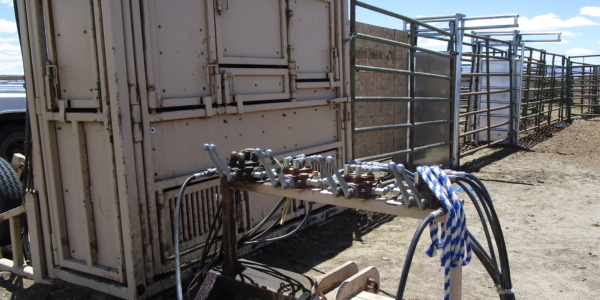 (*Veterinary costs for the initial phase of this project were covered by the ASPCA and the Unwanted Horse Coalition). With your help we can raise $120,000! This ensures that the Gila herd’s Northern California pastures are paid for through March 2019! 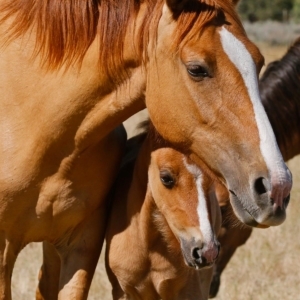 THESE MARES AND FOALS NEED YOU TO WATCH OVER THEM. Who will you watch over? Will you watch over the Gila herd? A matching gift from the Griffin-Soffel Equine Rescue Fund takes your donation twice as far. 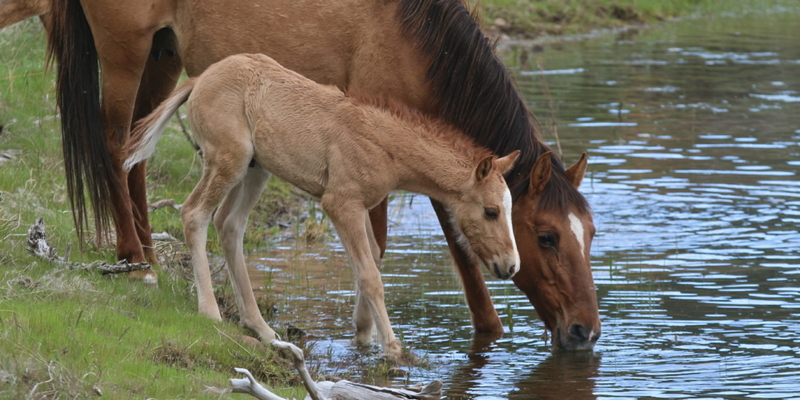 Will you watch over a foal? 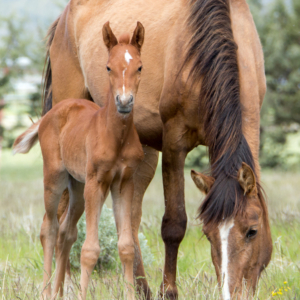 Your monthly gift sponsors a Gila mare and her foal. Select the family of your choice from the photos. A matching gift from the Griffin-Soffel Equine Rescue Fund takes your donation twice as far. If this is In honor of or in memory of a loved one, please enter their full name. If you would like to sponsor a foal and their mom please check the box next to their name below. 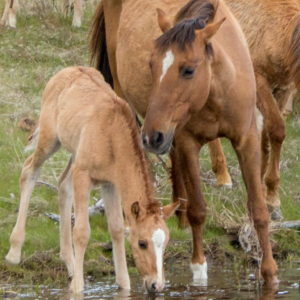 *Sponsors will receive a certificate and photo of the foal and their mom. All donations help RTF continue to provide sanctuary and care for the over 500 horses and 44 burros in our care which includes the Gila herd, and continue to advocate for their brothers and sisters on the range.